This page has information about growing pineapple at home in the Northern Territory (NT). Name: pineapple, ananas comosus (bromeliaceae). Origin: Brazil, Paraguay and Argentina. Distribution: pineapples are grown in tropical regions. Australian distribution: pineapples are grown in the NT, northern New South Wales, Queensland and Western Australia. Pineapple is a biennial or perennial herb, meaning the plant can live for two years or longer. It grows up to 150cm tall. Leaves are sword-shaped and up to a metre long. The leaves are arranged in a tight spiral on the main stem. Flowers are small and reddish purple. Pineapple fruit has long leaves, a tough skin and sweet, yellow flesh. Pineapples thrive in climates with daytime temperatures of 30 degrees Celsius and night temperatures of 20 degrees Celsius. How big it grows is directly related to temperature. Growth is slow in cooler months. Pineapples can tolerate drought conditions but prefer climates with 1,000mm to 1,500mm annual rainfall. Poor rain can hurt growth. Pineapples can grow in a range of soil types provided there is good drainage and a pH of 4.5 to 6.0. There are two pineapple varieties available in Australia. Cayenne pineapple is a large plant with long, reddish grey leaves. The fruit is large and deep yellow when ripe, with pale yellow, juicy flesh. It is often referred to as a smooth variety. Queen pineapple is smaller and has compact, grey green leaves. The fruit is smaller with a deep, golden yellow flesh. Queen pineapple is often referred to as a rough variety. 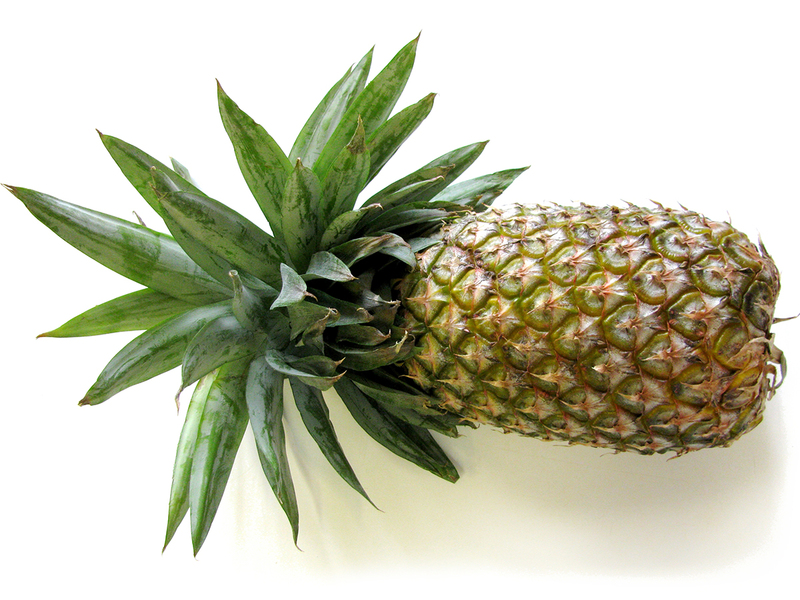 Pineapples can be propagated from the tops, slips or suckers. Pineapples are planted into raised beds in double rows. Light watering is needed during dry periods. Use mulch to control weeds and conserve moisture. There are several pests and diseases that affect pineapple plants, including nematodes, symphylids, fruitlet core rot, root rot and nutrient disorders. You will need to look after your pineapples to reduce crop loss or damage. Pineapples produce fruit from November to March. Maturing pineapple fruit can get sunburnt and should be protected with paper or shade cloth socks. Fruit can be picked at half to full colour. Try not to bruise the fruit, as this can cause it to rot after it has been picked. Pineapple can be stored for between four and six weeks at 14 to 20 degrees Celsius and 80% to 90% relative humidity. Pineapples can be eaten fresh and are used in fruit and vegetable salads, cakes, jams, chutneys, puddings, or cooked with meats such as ham.